Captain Britain and Grant Morrison. | The Captain Britain fans' page and blog. Captain Britain and Grant Morrison. If I was asked to rate my top five comic book writers Grant Morrison would certainly be in my top three, maybe even occupying the prestigious number one slot. 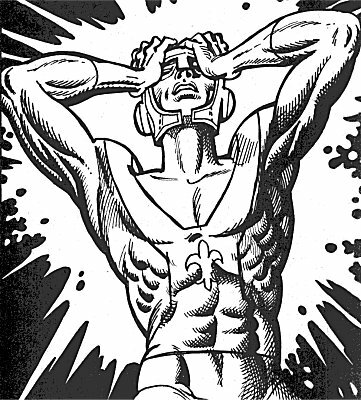 Hence I was a little disconcerted when I read his comments about Seventies Captain Britain in his book Supergods. The quote got me thinking about how much of it was actually true, so I decide to revisit Captain Britain from 1977 and see how much of what Morrison said seemed correct or not to me. Let’s be honest I undertook this not as an excuse to bash Morrison, simply because I thought it might be interesting to look at the quote in context. 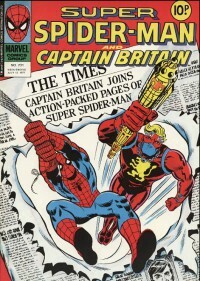 As a quick aside in Captain Britain Volume 2 issue 13 from 1986 Morrison wrote a short story about Captain Granbretan, who is pictured below. For some reason the good Captain reminds me of Morrissey, anyway let’s move on. First let me address the idea that the book was handled by an American anglophile, certainly writer Chris Claremont was born in Britain though artist Herb Trimpe was probably more of an anglophile having lived in the UK for some time, and traveled its length and breadth. 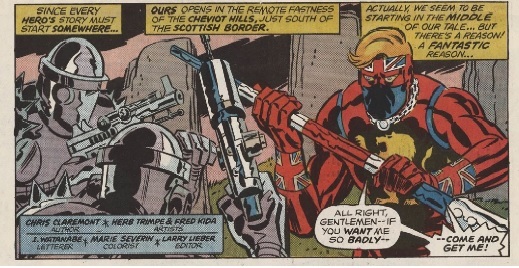 So Morrison is correct Claremont and Trimpe could indeed be described as anglophiles, but I’m certain Marvel threw their best staff at Captain Britain to make it a success, and I’m sure Claremont and Trimpe would have been wanted to contribute whether they had a British connection or not. Certainly when re-reading Seventies Captain Britain some of the ideas and art are so anglocentric it’s almost like the comic was made out of tweed. We have Merlyn, knights of old, ancient moors of mystic power and a sword in the stone, and they’re just in issue 1. Does this “anglophile” touch make the comic any worse, hell no it makes it the origin of Britain’s greatest superhero, just what it should be. Anything non-British shoehorned in would make Captain Britain’s illustrious origin and adventures all the less for it. Well the first issue takes place on a mysterious moor and inside a secret nuclear complex, not really very Tudor to say the least. However Cap does see a lot of action in London, where the distinctive landmarks of the city are woven into the plot, I can’t recall many Tudor tea shops though. Well check out my post on Captain Britain verses the Loch Ness Monster to see if you agree with that statement of Morrisons . OK it’s hard to tell the action takes place in Scotland if you take away the loch and Nessie, but the story is none the worse for its basic depiction of Scotland. I actually dislike comics that spend too many panels telling me where the action is taking place as it usually means the story suffers. My full thoughts on this statement and how Captain Britain was originally meant to be the UK version of Spider-Man can be read here. But yet again Marvel were not seeking to reinvent the wheel with Captain Britain, they knew what worked comic book wise, and they were never going to stray from their winning formula and risk losing sales revenue. So Grant Morrison was actually quite accurate in his summary of Captain Britain, but even so I’m certainly not going to burn my copies of All-Star Superman or WE3 in protest at what he said, there far too good for that. To me the facts about Captain Britain Morrison uses are to me what defined Cap and made sure he has a place in our big super hero loving hearts today. Without anglophiles and Tudor tea shops Captain Britain could have easily become a more mundane hero and not one that inspires me to write about him many years after his 1977 debut. This entry was posted in Opinion, Seventies Captain Britain and tagged Captain Britain, Grant Morrison, Marvel UK, Supergods by Richard. Bookmark the permalink.